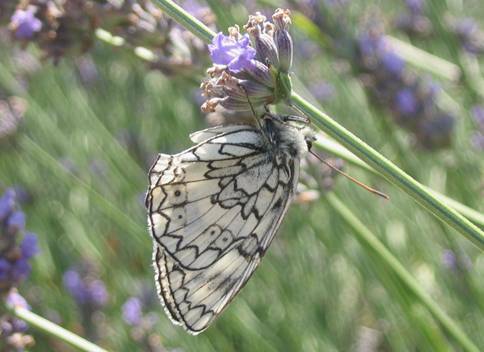 This marbled white species flies in parts of southern Europe below the 45°N latitude line and further north and east into Russia. I think it's main flight period is from late June through most of July and I would imagine it to be fairly common in its range like many satyrids. I only saw this one however, at the end of July and I was jolly pleased about it too! I had already seen good numbers of M.galathea at this site so I am lucky to have spotted the odd russiae. The underside of the hindwing is distinctive as it is 'bricked up' in the discal area right through the centre of the wing whereas the similar galathea has its 'bricks' reduced to a single line at the cell end. Equally russiae shows little shading in the discal and postdiscal areas and the two markings in the discal 'brick wall' in space 1 look rather like 'sausages' as Matt Rowlings correctly points out. There is a strong, black bar in the cell of the forewing though I didn't get a view of this (you can just see the extreme end of it on the forewing here, hugging the uppermost discal 'brick' of the hindwing.